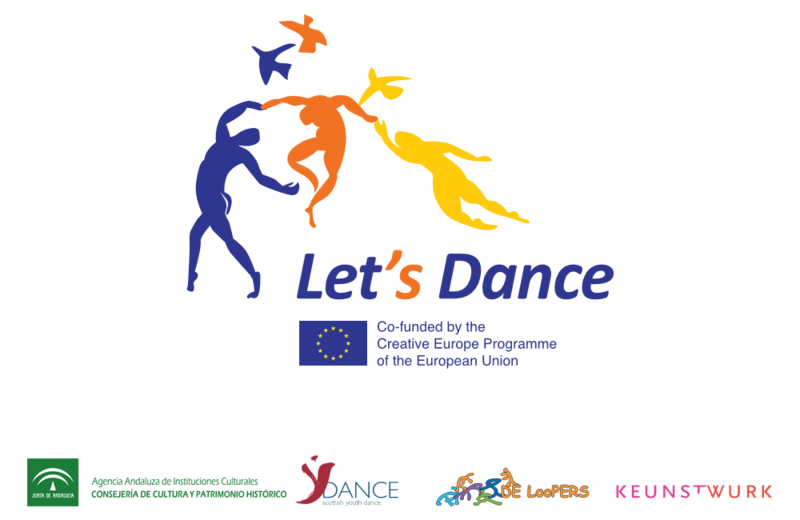 Wilfried van Poppel of DE LooPERS describes his thoughts and reflections of the Let’s Dance project. My first class of Laban-movement analyses started with the question: What is dance? I cannot remember quite well how many we were in that class, but each of the students came up with an answer. Each answer provoked another question and answer. In the end, the teacher said that all answers were correct. It shows the many many feelings, emotions and thoughts that come along with this question. So a next question in this case could be: What is Community Dance? If the answer to the question ‘what is dance’, is that diverse already, the answer to ‘what is Community Dance’ could be very diverse as well. Community: people living in one specific area or people who are considered as a unit because of their common interests, social group or nationality. It already stands for more than one person and there is something that holds this group together or bonds it together. How would I define Community Dance? His perception of community dance is “to dance with anyone, anywhere, at any time” regardless of their experience, age, gender or social or ethnic background. People sharing and creating a choreography and, very important, in the end owning a choreography. The dancers are the ones who in the end are presenting a choreography on stage in a theatre, in their community centre, in a park or in any setting open to public. They are performing so they also are responsible for what they are showing and presenting. If each dancer takes his / her responsibility for taking part in the creative process and the presentation of this process, the whole group will benefit from it and the whole group will be responsible for each other as well. It will bring them more together. The last years I have been reading books on Community Dance, articles, websites and so on, and everywhere the red line is for all Community Dance artists the same. Actually it says enough. It is the passion for the dance and sharing this passion with a wide variety of people and enjoying to see the people dance and move. As choreographer / dancer /mime and Community Dance Artist, I want to share my passion for dance and movement. I have been fortunate enough to be able to dance as professional dancer with different companies and touring all over, dancing on big and small stages, and still I am dancing on stage. On stage one is sharing a choreography with the audience. The audience becomes a part of what you want to tell and express with the movements, with your body. This experience and this passion I want to use and can use during my Community Dance Projects. The moment you are in front of a big group, try to win each one for your project, you have a big responsibility. During our projcts with youth, we don’t want them to just follow the instructions. The ideal situation would be that each of the dancers / participants also thinks with his or her body, that each one takes his or her responsibility in the process. Even when they have to learn an existing choreography, they have to dance and give colour to the choreography. It is not about: look at me dancing, look how good I am. NO, it is about what you can tell with your body what you can express. Everybody can do this, everybody has a body that can move, that expresses feelings and emotions. During a project we want each one of th edanders to give his / her maximum in order to discover or re-discover their possibilities. To me this is a very strong element in Community Dance. People discovering that they have possibilities, that they are able to achieve something positive and are able to use the body to communicate. They are able to move. If you want to ‘move’ people, you have to move people. How often we experience that participants in projects appear as new after a project. Discovering or having rediscovered themselves. A boy who was about to quit the school. During a project he noticed that he could do much more than he actually thought. He discovered his possibilities and then made the decision to stay in school and going for the final exams. A boy with obvious obesity who did not feel like joining a school project, with the excuse that he could not dance. After two days in the project, a ‘Five Days to Dance’ project, he comes to me with the question if he could participate in other Community Dance Projects. He felt his own possibilities and discovered that he enjoyed to move and he did not need to be ashamed. A girl who always kept hid in class and during a project was able to express, she could tell her body. She noticed that she has a lot to say, has a lot to offer and flourished completely. There are many of this kind of examples to give. Take away the shame, the embarrassment; express with your body – your movements. Your body which you have with you every moment of your live. In our projects, with small groups and with large groups, each one is important. Every “dancer” has something nice to offer, something good, something positive. When they go on stage, in a theater, a sports hall, the gymnasium at school, they expose themselves to the public and it works only if everybody believes in themselves and feel strengthened by the community with which they are on stage. Recently, I heard someone saying: you can not do it alone. To achieve something, you need others. The ‘self-made man’ does not exist. This person also needs others to achieve what has been achieved. A Community Dance Choreography is danced by a “community”, big-small, young-old with all the possibilities each one of the dancers has. Nobody is alone. Each one needs the other to bring a project to a good ending. Looking back on what I have been doing, and still do, the last 15 years after leaving the Tanztheater Bremen in 2002. Did it ever occur to me that I was going to be involved in Community Dance? No. I wanted to create dance pieces and started working with young people. 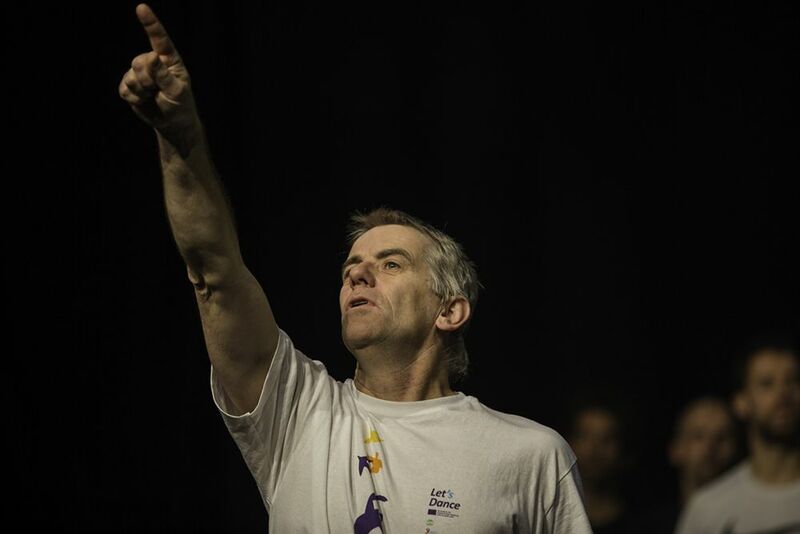 Creating dance theatre production with young people, young people who never danced before. One thing led to the other. I came across the project Dance4Life and not long after that got to know Royston Maldoom. Only then the word Community Dance came around to corner. The work which I had been doing up untill then with young people all of a sudden could be labeled as Community Dance. But then again… in the 90s I was working with young people at the Vrije Hogeschool in Holland, Each semester for three years, I created a dance piece with young people who did not dance before and did not have the aim of becoming a dancer. But they enjoyed sharing a creative procces together. Was I already doing Community Dance without knowing it, was I being aware of it? Maybe yes, maybe not. When I do my projects, in schools, in Community Centres, in Cultural centres, actually wherever, I don’t think about the label. I want to create a choreography with people. People without a professional background. A very important moment to me was when I got to know the work of Royston Maldoom and Royston himself as well. I got inspired by it and got inspired by him. As I then started creating choreographies with big groups I discovered the possibilities and power of working with big groups and the strength of each individual dancer, even when they dance in a group. It is wonderful and exciting to see a group dancing and moving. It is not only the dancing but also the connection we establish with the dancers. Writing about Community Dance feels somehow strange, because you write about something that you want to do and what you are actively doing. I am trying to find the right words and put on paper. It is not my profession to write. I move, I dance, I can talk about it while at the same time moving / dancing. The projects we do are not always easy but in the end when you see the joy, the happiness, the fullfillment, the accomplishment and last but not least the pride in each of the dancers after a performance, it makes oneself super happy as well. When we start a project we first have to bring the participants / dancers into our world of dance. A vast majority of the dancers in a new project never participated in a dance project before so they enter a new world. Working in schools it often happens that we deal with students who don’t have the slightest idea of what they are about to do. So welcome in our world of dance and movement. We start with basic excercises to try to take away immediatly the embarresment, the shame and to be aware of each other. Walking without shoes, just walk each and everyone for him and herself. Walk indifferent direction, using the the whole available space in which we work. Don’t walk together with friends and don’t talk. Walk in different rhythms: fast – slow – medium. Walking without shoes is important; we want that the participants feel the floor and not feel the shoes. Next step is: freeze. Walk and freeze. This is followed by making a position with your body in the freeze. Not just stop but use your arms, legs , upper body to make an ‘interesting’ position. Repeat this and start using different levels: high – middle – low. For example hands on the floor and one foot off the floor. Anything is possible. After this: make a position with two people: supporting each other, touching each other. There has to be contact. Then with three persons. This enlarges the possibilty of carrying and supporting. With four ; thean four groups – two groups and in the end everybody together. Each time the group gets bigger. People have to have contact with each other, lifting , supporting. It is a wonderful excercise to start with. Directly creating a shape, creating something together. It is a playful start of a project. After this we follow with a warming up during which approach the articulation of the body and the movements. Streching your arms up is not only arms up but the whole body should be involved. With basic movements we look upon the body as a whole and try to make people aware of this. Find your centre and use this as a stringhold for moving. Through the excercises we touch moving the arms, shoulders, legs, feet, Finding your balance, shifting weight, coordination. Isolated movements will be combined to create more ‘complicated’ excercises. We emphasize that you only can profit of the excercises and movement, that is only works when you do yur maximum. Only then you can find and expand your limits. Each participant / dancer has to find his or her way of using the body also in a given choreography. I cannot impose our own technical standard, as professional dancers, on the participants. In all the exercises we do ,we challenge the participants in order to make them feel somehow more free or able to do the choreography afterwards in the rehearsals. We feel, as do many Community Dance artist, that the modern dance and Tanztheater is very appropriate. Even elements and / or structures coming from traditional dance. Using clear images in a way visualizing the image and making this image physical. This is a wonderful tool to imagine movements and start creating choreography. To me discipline stands for ‘responsibility’. Giving room and space to creativity is very important. Everybody is innately creative even if that is not given external recognotion. We all can create words in our imagination. Cultural poverty holds people back from making their just contribution to society and prevents them from becoming what they could be. Goethe said: “artists have to see spirtis, then afterwards everyone sees them. ‘Good Morning Creativity’ published byFundación Botin, Santander. “Introduction: Creative awakenings……” written by Christopher Clouder. We are dancers, choreographers and use our body as a tool. In the project ‘Let’s Dance! Europe we were able to meet and bring together people with different and ages from Bremen, Granada, Glasgow and Leeuwarden. Shared creative potential, created a wonderful production, learned from each other, laughed together, had difficult moments and moments of enlightenment. Let us hope that this project was, as Amaya says, the planting of a seed that will get its time to grow.